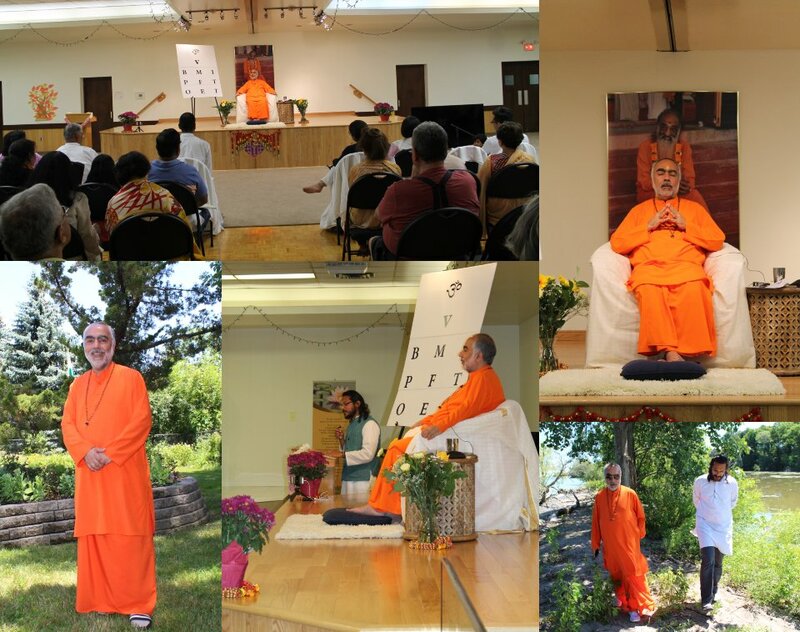 Early July 2018, Pujya Swami Swaroopananda visited Chinmaya Dhara in Niagara Falls for the first time ever. This small center, guided by Vivekji and located in a city that serves as a conduit between two great North American nations, was eagerly awaiting Swamiji’s visit. The mood was festive, buzzing with excitement, yet calmness pervaded. Swamiji spoke for two nights, on the small yet profound Laxman Gita, where Laxmanji speaks to Nishad Raj on the importance of karma, and on how to find joy in daily living. With Bhagawan Krishna and Bhagawati Radha looking on, Swamiji expounded on great truths from our scriptures, in simple ways that resonated with all. Learning from Swamiji is always a special experience, but even more so is the opportunity to spend time with Swamiji in intimate settings. Many such opportunities presented themselves for devotees, to be with Swamiji and take in the beauty and charm of Niagara Falls. Satsangas by the lake-front, visiting local businesses and other such moments touched us all deeply. And like the fragrant flower that attracts bees, birds and other creatures, being around Swamiji meant being around other teachers and guides, who flock to Swamiji, like baby ducklings to their mother. Not only was our Vivekji present, but others such as Devji and Ginaji from Toronto, Sachinji from Kitchener, and Rahulji and Priyaji from Washington D.C also travelled to see Swamiji. At the end of the day, the benefit was ours, to be able to learn both in so many ways. And although the experience was one that none will forget in a hurry, us humans are after all a greedy bunch. The main sentiment going through everyone’s mind as Swamiji left was, why only two days? Why not longer? Of-course, we want Swamiji to return, soon and for longer. In the mean-time, we will endeavor to be worthy of God and Guru’s grace and blessings, by reflecting on Swamiji’s message and living a simple and joyful life.